Make the arrangements to meet the god Vivec and receive the plan to defeat Dagoth Ur. Once the Fourth and Fifth Trials are completed, go to the Temple Canton in Vivec to meet with Archcanon Tholer Saryoni. Talk with Danso Indules near the entrance to the High Fane and arrange a meeting with the Archcanon. Enter the Archcanon's office from the locked back door in the Hall of Wisdom. Talk with Archcanon Tholer Saryoni to arrange a meeting with Vivec. Go south to the Palace of Vivec, and talk with the god. Receive the five step plan to defeat Dagoth Ur. If Vivec has already been defeated, refer to the Yagrum Bagarn and Wraithguard article to learn how to use the Wraithguard. By now you should have either completed the Fourth and Fifth Trials (being named Hortator by the three Great Houses and Nerevarine by the four Ashlander Tribes), or bypassed them (by being at least level 20 and having 50 or more reputation). You will be told that you should meet with the Archcanon in Vivec High Fane, so head there now. Meet with Danso Indules in the Temple Canton of Vivec, in the central exterior tunnel. Danso says that Archcanon Saryoni is waiting for you in his private quarters in the East Chapel of the High Fane. Once you enter the High Fane, you quickly discover that the Archcanon is actually behind a locked door. Unfortunately there's an Ordinator standing nearby which means that none but the most stealthy of characters may wish to try it. There is a back door from the Hall of Wisdom and, although the door is still locked, there's no Ordinator on watch. To reach this back door, just walk/run through the large half-domed corridor past the woman standing there and proceed forward down the steps and turn left. Upon entering door you should be standing in the hallway, (click on local map) move forward to the middle section (you'll see on map 3 rows of entry) take the middle path going left and walk forward to opening and turn left again and go upstairs. (local map w/your cursor will show High Fane entry). Once inside the Archcanon's office, you can talk with Tholer Saryoni. Choose "Temple's doctrine," and after a brief talk, you are given the choice to visit the god Vivec, who will hopefully shed some more light on the current situation. When you say yes, you are given two keys: for the Archcanon's office and the Palace of Vivec. You are warned that the Ordinators are still not under Tholer's control. The Palace of Vivec can be found at the top of the puzzle canal, south of the Temple Canton. You can find Vivec just inside the entrance. Vivec goes over the plan for you to follow in the future (assuming you accept all the items and oaths). You receive the Wraithguard, a powerful right gauntlet needed to defeat Dagoth Ur. 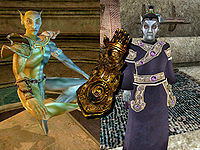 Vivec gives you his blessing and says that he will end the persecution of the Dissident Priests and the Nerevarine by the Tribunal Temple (After which the Temple ends its hostility and you can join the Temple or complete any open Temple quests). You receive detailed plans on exactly how to go about defeating Dagoth Ur. A series of aggressive raids within the Ghostfence. A series of aggressive raids to neutralize Dagoth Ur's ash vampire kin and recover artifacts from the bodies of said kin. An assault of Gate Citadel Vemynal to neutralize Dagoth Vemyn and recover the artifact hammer Sunder. An assault of Gate Citadel Odrosal, to neutralize Dagoth Odros and recover the artifact blade Keening. An assault of Citadel Dagoth Ur with the artifacts Wraithguard, Sunder, and Keening to sever Dagoth Ur's connection to the Heart of Lorkhan and thus to destroy Dagoth Ur. The plans Vivec gives you are detailed and are of great aid, so read and use them. 1 Athyn Sarethi gave me a sealed package containing a message sent on behalf of Archcanon Saryoni, High Archcanon of Vivec. In the event that I become both Hortator of the three Great Houses and Nerevarine of the four Ashlander tribes, Saryoni invites me to a private meeting to consider my claims. Once I am Hortator and Nerevarine, I should speak with the healer of the High Fane of Vivec, Danso Indules, to arrange the meeting. 5 The archcanon is in his private quarters, and he wants to speak with me, but I must avoid confrontations with the Ordinators at all costs, because spilling the blood of faithful servants of the Temple will make a reconciliation more difficult. The archcanon has spoken with the High Fane Ordinators, but if I am a wanted criminal, they may try to arrest me. 20 The Ordinators guarding the High Fane know that I have come to meet with Saryoni. They warned me not to break the law, or they will take swift action. 25 Archcanon Saryoni accepted my apology for killing the Ordinator guard at the High Fane. He said it was time to risk trusting one another. 30 Archcanon Saryoni has suggested that the Temple's policy concerning the Nerevarine might change, and has arranged a private meeting with Lord Vivec. He gave me two keys: one to the private back entrance to his quarters, the other to a locked entrance to Lord Vivec's palace. He says the Ordinators are not under his control, and asks that I avoid them. Lord Vivec is expecting me, and perhaps I shouldn't keep him waiting. 34 I refused to accept Wraithguard from Lord Vivec. He dismissed me, but told me to come back if I changed my mind. 36 Lord Vivec asked me if I would accept Wraithguard, and he would not accept my answer of 'maybe.' He dismissed me, but told me to come back if I changed my mind. 38 I refused to swear my oath, before all gods and men, before all spirits visible and invisible, before my honor and Vivec's honor, to dedicate myself and Wraithguard to the defeat and destruction of Dagoth Ur, and the preservation of Morrowind and its people. Vivec said I would not find Wraithguard useful, because without my oath, he wouldn't teach me its use. He dismissed me, but told me to come back if I changed my mind. 40 Lord Vivec wouldn't accept a 'maybe' in answer to his demand that I swear an oath to dedicate myself and Wraithguard to the defeat and destruction of Dagoth Ur, and the preservation of Morrowind and its people. He said I would not find Wraithguard useful, because without my oath, he wouldn't teach me its use. He dismissed me, but told me to come back if I changed my mind. 50 Finishes quest I accepted Wraithguard from Lord Vivec, and I swore my oath, before all gods and men, before all spirits visible and invisible, before my honor and Vivec's honor, to dedicate myself and Wraithguard to the defeat and destruction of Dagoth Ur, and the preservation of Morrowind and its people. Vivec somehow taught me how to use Wraithguard. He then offered to give some explanations, or to let me go immediately, as I wished. 55 Finishes quest To defeat Dagoth Ur, Vivec says I must go to Red Mountain to recover the artifact hammer Sunder from Gate Citadel Vemynal, then the artifact blade Keening from Gate Citadel Odrosal. Then, with these artifacts and Wraithguard, if I destroy the enchantments on the Heart of Lorkhan in Dagoth Ur's citadel, Dagoth Ur will be destroyed, and the Blight ended. Vivec gave me 'The Plan to Defeat Dagoth Ur' to explain the details. 1 Nibani Maesa says I must go to Vivec's high priest, Saryoni, and demand to speak with the false god Vivec. She says Kagrenac's tools are the keys to the riddle of the Sixth and Seventh Trials, and that I must get them from Vivec. 1 Athyn Sarethi was concerned that I had not fulfilled the Nerevarine prophecies. He says that Archcanon Saryoni hopes I will come speak with him at the High Fane in Vivec City. 1 Crassius Curio seemed concerned that I had not fulfilled the Nerevarine prophecies. He says that Archcanon Saryoni hopes I will come speak with him at the High Fane in Vivec City. 1 Divayth Fyr was surprised and disappointed that I had not fulfilled the Nerevarine prophecies. He says he has heard rumors that Archcanon Saryoni hopes I will come speak with him at the High Fane in Vivec City. 1 Mehra Milo was concerned that I had not fulfilled the Nerevarine prophecies. She says that Archcanon Tholer Saryoni, the high priest of the Temple, is desperate, and that he asks that I come speak with him at the High Fane in Vivec City. She begged me to go to Saryoni. 1 Gilvas Barelo was concerned that I had not fulfilled the Nerevarine prophecies. He says that Archcanon Tholer Saryoni, the high priest of the Temple, is desperate. Barelo asked me to go speak with Saryoni at the High Fane in Vivec City. 1 Nibani Maesa was concerned that I had not fulfilled the Nerevarine prophecies. She says she hears that a man named Tholer Saryoni, the leader of the Temple, is desperate. Nibani Maesa asked me to go speak with Saryoni at the High Fane in Vivec City. 1 Finishes quest I have killed one of the leaders of the Ashlander tribes. Now there is no possibility that I could be accepted by the Ashlander tribes as the Nerevarine of prophecy. 50 I have been named Hortator of all three Great Houses, Redoran, Hlaalu, and Telvanni. Of the Seven Visions of Seven Trials of the Incarnate, I have now fulfilled the Fourth Trial. 50 I have been named Nerevarine by all four tribes of the Vvardenfell Ashlanders -- Urshilaku, Ahemmusa, Zainab, and Erabenimsun. Of the Seven Visions of Seven Trials of the Incarnate, I have now fulfilled the Fifth Trial.